Sometimes I wonder if Trevor and I created the WunderKeys program just so that I could live out my lifelong dream of being a party planner. The creatively-illustrated and themed lessons in every book allow me to dream up and then share coordinating supplementary activities that help turn every lesson into a perfectly-themed piano experience. And when a holiday rolls around… look out… because the party planner in me sees an opportunity for excitement that can’t be wasted! 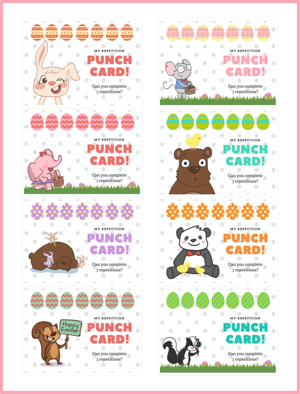 With Easter just around the corner, today we’re sharing three printables to bring a hoppin’ piano party to your lessons this week. These include 1) Easter-themed Repetition Punch Cards to track piano practice or in-lesson drill, 2) Easter-themed Lesson Assignment Sheets (Preschool and Primer versions) to keep the lines of communication open, and 3) A set of three Easter-themed Photo Props to share lesson experiences with family and friends. Click on the images below to be taken to our resource page – you’ll find these printables as the most recent posts. And while you’re here, don’t forget to check out our WunderKeys Method Books on Amazon.